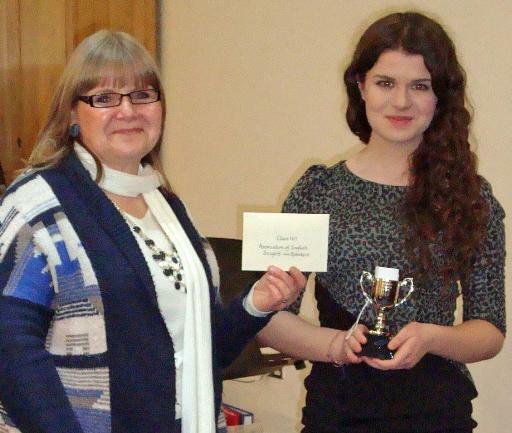 Carolyn Richards is pictured awarding the AESS Centenary Trophy and £25.00 cheque to the winner of the English Song & Speech class, 167, on Friday February 22nd 2013 at The Forest School, Snaresbrook, London. The winner was Miss Fiona Kennedy with a very effective spoken introduction followed by a good performance of ‘Bitter Blow of Love’ by Mark.R.Slaughter and ‘Moonfall’ by Holmes (The Mystery of Edwin Drood). This entry was posted in Past Events on February 22, 2013 by AESS. As part of the Centenary celebrations British and International Federation Festivals were asked to apply to be included in a scheme to award a Trophy and a cheque for £25 for a Junior AESS class that would be included in their syllabus. Ten festivals expressed a wish to be involved and the first to hold the competition was Eastbourne,last Tuesday, where an 11-18 year–old class was won by Chioma Uma. Her theme was ‘Owls’. 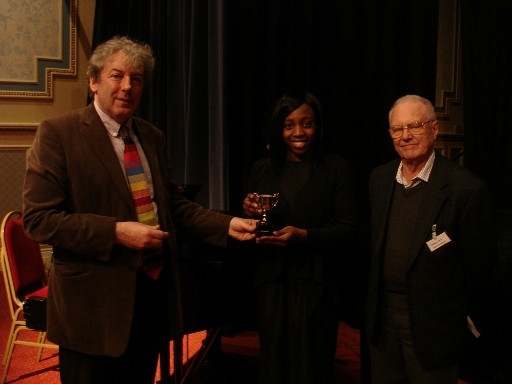 In the photograph Graham Trew is presenting the trophy to Chioma Uma, watched by John Crawshaw, the Executive Chairman of the Eastbourne Music and Arts Festival. This entry was posted in Past Events on February 12, 2013 by AESS.